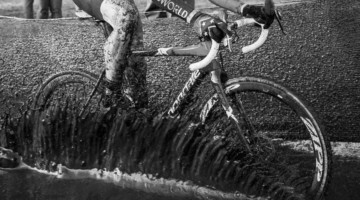 With three riders in the top 20 of the current UCI world rankings and the entire team, including 19 year-old Kaitlin Antonneau on the women’s side, set to represent the US at the upcoming World Championships, it’s hard to imagine that the best may be yet to come for the Cannondale prepared by Cyclocrossworld.com team. 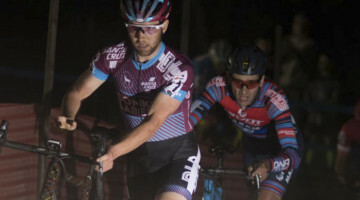 But this past weekend Tim Johnson took things to a whole new level, narrowly missing out on a top-10 finish among the best of the best at the World Cup in Pont Chateau, France. 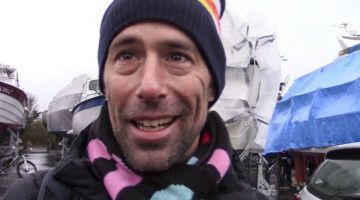 Cyclocross Magazine‘s Robbie Carver was able to catch up with Johnson to talk about the World Cup, the road to Worlds and riding with Jeremy Powers and Jamey Driscoll. 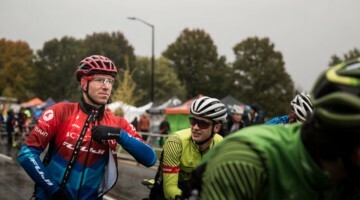 Cyclocross Magazine: Congratulations to you and your boys on such a strong showing this weekend! How was it sitting in the top five? Tim Johnson: Thanks! It was definitely a solid start to the trip over here. No issues pre-race, besides getting out of New England a day early as the two feet of snow were about to fall. 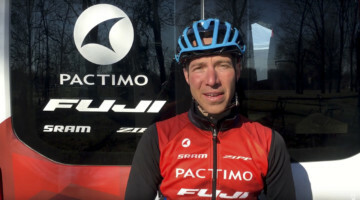 I was just riding with Jamey yesterday and was telling him about how much of the course Sven was using in comparison to anyone else. Riding in the group with him was bordering on amazing. He’s got a calmness about him even at blistering speed, always picking lines that are contradictory to anyone else’s and keeping his speed up with seemingly little effort. I learned a few lessons. The lead group was so big that I tried to move up when possible; the only problem with that is that the speed was so high, it was pretty tough. I had enough to stay in there, but not enough to rip by everyone…I covered an attack by John Gadret through the start/finish with a few laps to go and was a little dismayed when he couldn’t keep the pace high shortly after. He was absolutely crushing it on the hills but creeping through the corners…it was as if he couldn’t dare to go through at a ‘normal’ speed without slipping or crashing. CXM: What did you guys talk about pre-race? Did you put Jeremy up to his hole shot? What did you think of his and Driscoll’s performance? TJ: Pre-race we had a chance to ride the course and chat a bit. Jeremy and I were sure to be on the second row, with such a long start straight I think it’s actually easier to start second row as opposed to first. The chances of shooting around the front line near the end of the straight is much higher. 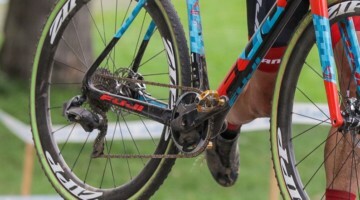 Jamey actually lined up right with us as Stybar was missing. Jeremy hit it and I followed him right into the first two corners. It worked out perfectly, he just missed the hole shot and I slotted in top five. There was a crash a third of the way into the lap that tangled me up and dropped me back towards 25th or so. I had to get back up to the front group by lap three and then surfed in and out of that group the whole rest of the race. CXM: How did you like the course? TJ: I think that course in Pont Chateau is great and unique in it’s speed and size but also has some similarities to the Louisville course for 2013. It’s going to be wide open in some spots and the elevation will come in distinct chunks. This race was much more difficult than expected because of that elevation – Louisville will undoubtedly be easier. CXM: Any hopes or plans for next weekend? TJ: This week I’ll be trying to tune up the workouts just a little bit in hopes of grabbing onto some more power. This last training camp I had in Cali was very difficult, and it’s one that either really makes the legs pop (good) or makes them pop (pssssst, bad). Can’t overdue it, that’s for sure. CXM: How’s Europe treating you so far? TJ: Europe is always pretty good, after doing this trip for years, the little things are now little and the re-entry doesn’t burn us up anymore. The travel is something that I’ve learned, more often than not, has a real effect on performance – in years past, I could always push through it. Well, this year with three trips in four months, it’s gotten a little bit harder! CXM: Thanks for talking with us. And Good Luck!